I worked more on Zant! I made the other views, fixed the over all body a little bit (Hardly noticeable) and added a mouth, 4ndaKava. I think it looks better with a mouth now. I also tried to make Zant hug himself and turn in this weird way like he does in twilight princess just before the battle, and I think it turned out ok. I made my attempt of Wolf Link. I only did the front view. That Wolf Link looks nice! Its so small haha! But why is it green? I animated my Wolf Link to howl and run. And I added Midna too. I attempted to sprite Ganon from Twilight Princess into Minish cap style. I am using the in-game model as a reference from here. I was also inspired by Pepeztyle´s Twilight Princess Ganondorf, which you can see in his Ralph sheet here. Anyway, that looks incredible Brad! Seems like a daunting tast to complete, just imagine animating that thing. I'm not quite sure which sprite you are refering to when you said they are geing used haha. Recently Ive been trying to make sprites from scratch to challenge myself to improve. For Ganon I used the model, resized it and worked from there. Zant was also made from scratch for example, it took me a while to get the mask right, that was quite hard. I'm not quite sure which sprite you are refering to when you said they are geing used haha. 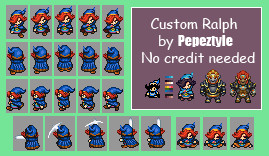 Recently Ive been trying to make sprites from scratch to challenge myself to improve. Anyway, I fixed the front view a bit and made the front/diagonal. Next will be the side view. How does the new view look? Another view done! I´m having to much fun spriting this. I attempted to make the Guardians from Breath of the Wild, I only did the head. I also edited Link and made the BotW version, with the Champion´s clothes. Also, I sprited the Breath of the wild font, the Sheikah writing I mean. Your spriting skills are getting better, great to see! Just made a quick edit of your Link sprite. Do what ever you want with it. Wow, that looks much better! I may animate it in the future, though I'm not sure. And thanks! A simple edit of the MC trees to make more variations. I always thought the original trees were too short, so I made some that are taller. EDIT: I edited the Minish Cap cliffs so that they can be placed diagonally and are much smoother, and so that they can be taller if the mapper wants them to. You can see how they work on the example.